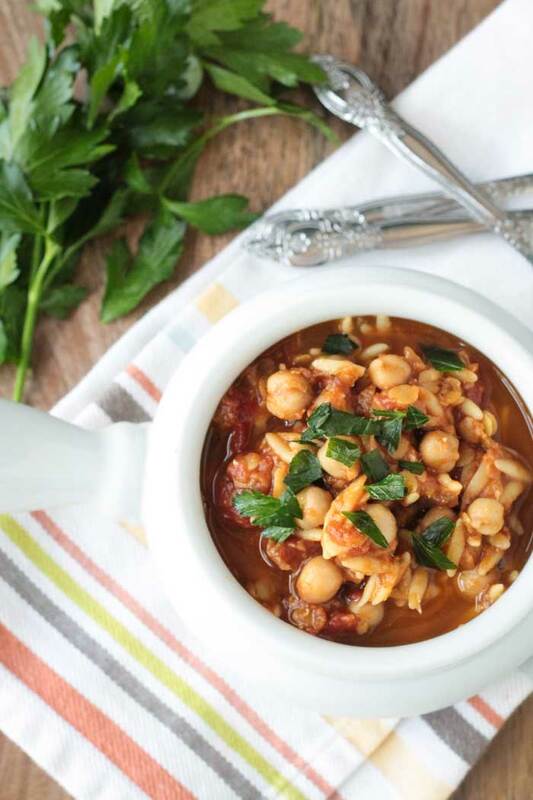 Red Lentil Stew with Chickpeas and Orzo is just as hearty as it’s name. Luckily, you can throw all the ingredients in your slow cooker for a few hours and dinner is served! Back to school and after school activities means less time for getting a proper meal on the table. I’ve already shown you a quick and easy way to take care of breakfast and snack time with these Baked Oatmeal Muffins, but what about dinner time? Enter your slow cooker! If you don’t have one, I highly suggest you get one. It’s so easy to throw all the ingredients in the slow cooker in the morning so you can come home to a nourishing meal that’s ready when you are. 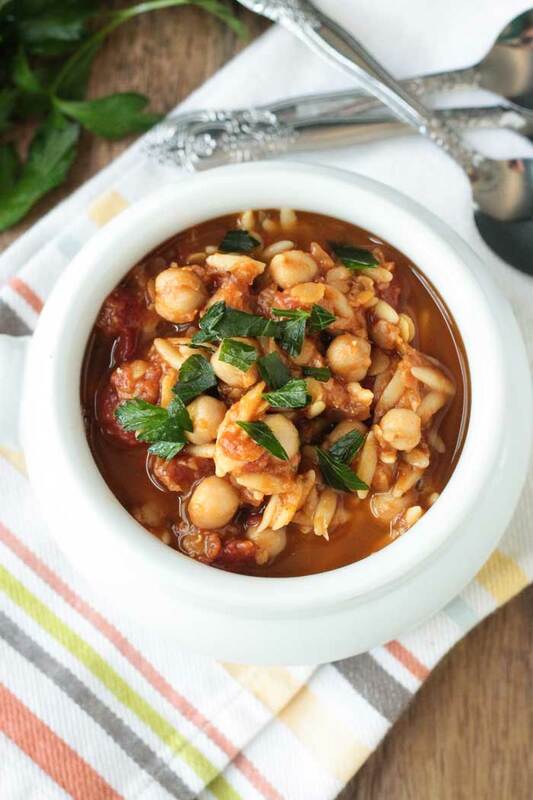 This Red Lentil Stew with Chickpeas & Orzo is one of our favorites. Give it a try today! In this day and age when pretty much everything can be digital and programmable, I suggest you go this route. Of course, an old school slow cooker with the only options being High and Low will work just fine, but I think it definitely is more limiting. Especially with plant based recipes that don’t take nearly as long to cook as meat based dishes. If you turned it on in the morning and it only requires 3 hours of cooking time, you’re going to come home to mush. Nobody wants that. The Instant Pot (<- affiliate link) is by far my favorite choice. They are not paying me in any way to say this and I bought my Instant Pot on my own, with my own money. I just really love it and I think you will too! It’s actually more than just a slow cooker. It performs 7 different functions and it’s best known as a pressure cooker. Besides being a slower cooker and pressure cooker, it can also be used as a rice cooker, for browning/sautéing, a yogurt maker, a steamer and a warmer. No more cluttering up your kitchen with multiple appliances. It’s fully programmable with an auto “keep warm” function after the cook time is up. Or you can program it so it delays the cooking start time until many hours later. I love this appliance so much, I even bought one for my mom. Want to know what other kitchen tools I recommend? You can see my choices here. 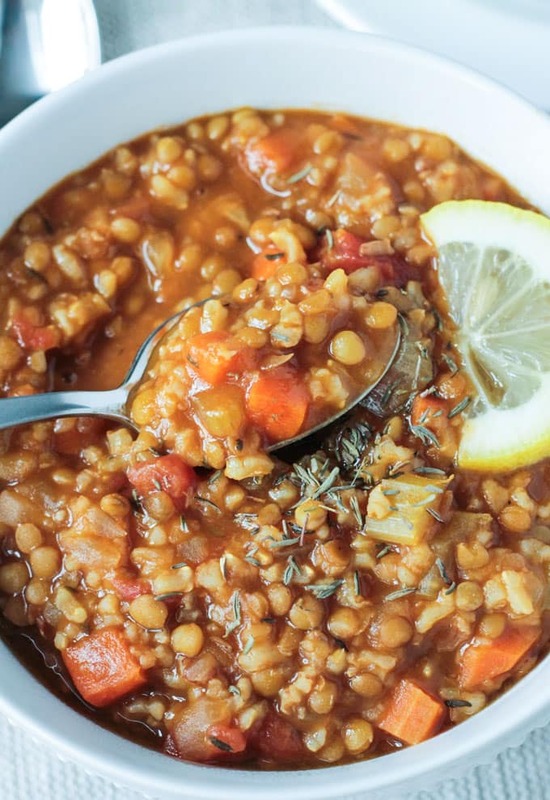 Let’s get back to this delicious red lentil stew! 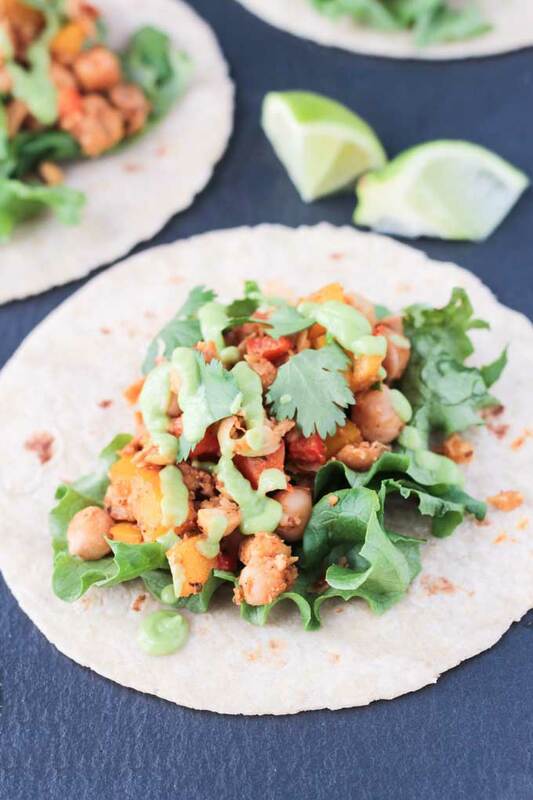 Lentils and chickpeas (garbanzo beans) and are super high in protein, fiber, B Vitamins, iron and more! They are also very low in calories with virtually no fat. Nutritional powerhouses! I like the addition of the orzo in this stew. Kids tend love little pasta shapes. But brown rice or macaroni noodles would also work. 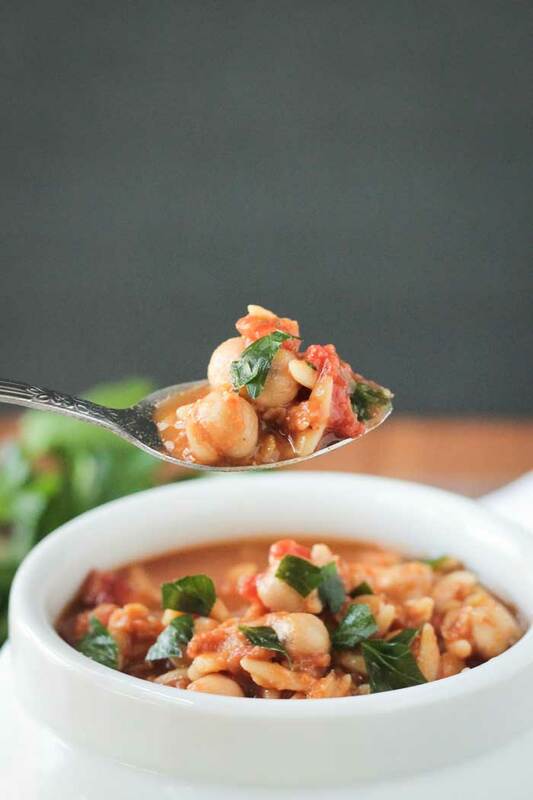 I’ve lightly spiced this soup with cumin and added a smoky kick with smoked paprika. Fresh parsley thrown in at the end brightens up the whole thing. I’d love to hear what you guys think of this easy Red Lentil Stew recipe! Please leave me a comment below with your feedback and star rating. You can also find me on social media. Be sure to tag @veggie_inspired and #veggieinspired so I don’t miss it! Enjoy! 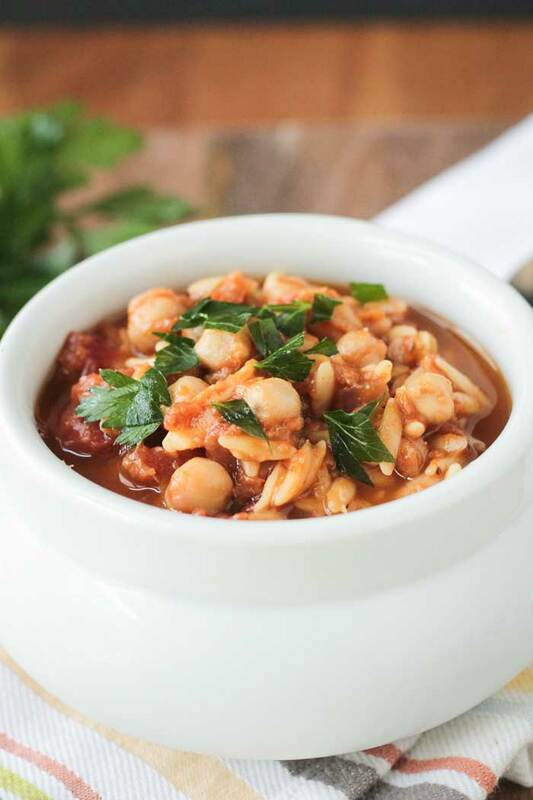 Cozy and comforting Red Lentil and Chickpea Stew with Orzo is an easy meal for any night of the week. Made in the slow cooker, you can prep dinner ahead of time and enjoy it whenever you are ready. Sauté the onion and garlic in 2 tbsp veggie broth in a small pan over medium heat*, for about 5-6 minutes, until softened. Add the onions/garlic along with everything else, except the orzo and parsley, into the bowl of your slow cooker. Cook on high 2-3 hours until the lentils are soft. Add the orzo and cook on low another 30 minutes until the orzo is tender. Taste and add additional seasoning (salt, pepper, etc.) as needed. Stir in the fresh parsley and serve. *If you have an Instant Pot, you can sauté right in that with the sauté function. Just make sure to change it to the slow cooker function when you're done with this step. ~Leftovers will thicken up considerably. To reheat - you may want to add additional vegetable broth to thin it out. Loved the red lentil chick pea stew. Served it as part of our Christmas dinner and it was a big hit. So flavorful! I added about 2 cups of kale with the orzo. It added great color and flavor. Thanks for the receipe! That’s wonderful. Thank you! So glad you all loved it. Hope you had a wonderful holiday! I made this recipe which turned out great. This dish was so flavorful & is going to be one of my go to recipes. This dish was easy to make & froze well. I’m so happy to hear you loved it, Dianna! Thank you!! I love when the weather starts to turn cooler and we can enjoy cozy soups and stews all the time! Love it. Thanks, Sina! This looks awesome! I could prep it during Jonathan’s nap time and then it would be ready for dinner and I wouldn’t have to worry about it during the after school rush! Win! Yes, exactly! After school needs all the stress-relief it can get! I LOVE the Instant Pot! I have had mine for years. It’s the first generation one without the yogurt maker. This stew looks delicious! Isn’t is the best?! I use it all the time! I have yet to make yogurt, but it’s on to-do list! Thanks, Amy! I love meals like this. It looks delicious, Jenn! I need to clean out my kitchen cabinets to make room for this pot. I use mine so much that I leave it out on my counters. You can cook dry beans without soaking in about 20 minutes!! This sounds and looks so good right now, and not just because it’s a deary rainy day. I’m going to have to add this to the list to make, I love the addition of lentils in it for protein! Oh, are you in the midwest too? It’s pouring here right now! I got caught in the downpour, unprepared, this morning…totally soaked through and now my hair is a huge frizzy mess. LOL! Cozy stew will make me feel better though! 🙂 Thanks, Sarah. Yes Minnesota! It’s not pouring here but it is about 20 minutes north of me. I know there are flash flood warnings all over too and we had severe thunder and lighting storms that rocked the house Saturday and Sunday. Might have to make this ahead for tomorrow night with all of us eating at different times or next week. Or better yet Sunday after the apple orchard! Yeah, it totally flooded the streets here it came down so fast. I can’t wait to go to the apple orchards!! Our favorite one opens this weekend too. And it’s supposed to cool off, which will be nice! Okay, I need to get my little slow cooker out ASAP. It’s been ages and recipes like this are just begging to be made! Yep, time to get it out! Thanks, Alisa! Nothing better than cozy soups and stews! What a hearty soup! Love orzo. Orzo is a big favorite around here too. Something about those tiny pasta shapes! What a yummy, nourishing soup! I really love the unique flavors in this. The slow cooker lives on my counter this time of year, so I’ll have to try this. Tis the season for the slow cooker! 🙂 Thanks, Julie! This looks so delicious! Love that fall is on its way and we can start enjoying comfort foods like this! Fall is my favorite! Can’t wait for all the comfy, cozy foods! Sometimes I use my slow cooker even if I’m home all day. It’s just easier to throw it all in there in the morning and not have to worry about it again. 🙂 Thanks, Sonali! This looks amazing! I love a good stew, especially one that’s so hands-off to make! Thanks, Becky! It doesn’t get much easier! I’m not ready for fall so I’m having a bit of a conflict looking at this, ha! It looks delicious, orzo is my fave, and I’m sure I’m one of the few holding on to summer, but I just can’t do it yet!!! LOL!! HaHa! I totally understand. But I eat soup all year round anyway.. It’s just I need my slow cooker more once school…and the all the after school activites…start up again. This stew looks so healthy and delicious! I couldn’t live without my slow cooker! I don’t eat many lentils but this recipe gives me a reason to add them to my shopping list! Thanks, Laura! We eat some variety of lentils probably 3-4 times a week. I’m obsessed with them! 🙂 I hope you love this soup! 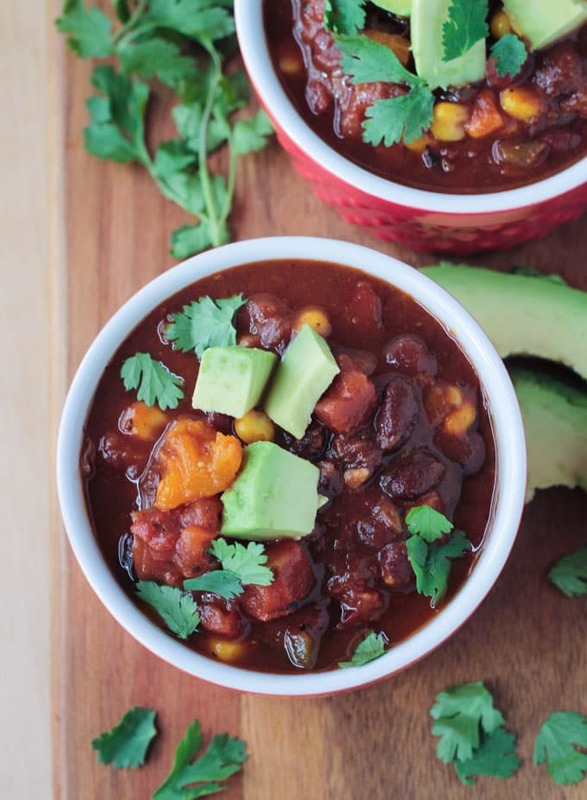 Any suggestions for using standard cooking methods (I don’t have a slow cooker, and am not sure I need one) for the slow-cooker red lentil stew of black bean & butternut squash soup? Thanks. Hi, Dan! Just found this is my spam folder. So sorry I haven’t responded sooner. You could definitely make this on the stove top. Red Lentils generally take about 15-20 minutes. Add your the orzo after the lentils are done and cook for another 10 minutes or so. Also check to see if you need more broth when adding the orzo – you may or may not need to add a bit more. Hope you love it!